my family got to review the fun Boochie game! It is great that you can do several fun things with this game! Get ready for this all new action-packed family game that will have you tossing, kicking, bowling, and throwing like never before! First toss out the soft foam Boochie target and then try to land your ball and hoop as close to it as possible. Keep score on a special wrist tracker that gives you a different outrageous throwing challenge every round. You may have to toss between your legs, behind your back, or even with your eyes closed! The player with the most points wins. Play Boochie... Have a ball! There’s a new name in indoor/outdoor games – Boochie! Whether you’re hanging out in the back yard, or heading to the park or beach, we guarantee you’re going have a blast playing this game. 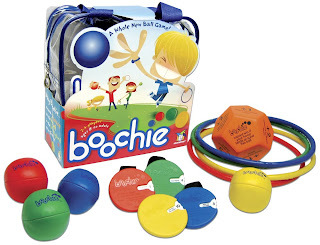 There are so many things to love about Boochie: from the active-play element, to the unique 12-sided rolling target, to the amazing variety of throwing challenges packed inside. No two games will ever be the same! Take note that all of the wrist trackers have completely different sets of challenges so be sure to try them all. Get out and play! to give away a Boochie game! Giveaway ends on Tues. Aug. 18th, 2009. How fun! We love finding new things to do and this would be great! thanks!! i'm a follower! love your blog!!! This looks like fun! :) It's always great to do something with the whole family! Thanks! This looks like a FUN family game. Count me in! I have the button! This looks like alot of fun! what fun! we'd love to try it ..
got your button (for some reason i can't get your book review button though) .. The game looks great, my kids would love it! Please enter me. Looks like a great game to play with my kids! I've seen this game....so cool looking! I love games, and this one looks GREAT even for my girls. What a cool set! I would love to win! My neighbors used to have a set and we'd play all the time. Now they've moved away and we need a game of our own. This game would be perfect for my family. It sounds really interesting , fun and different. Would love to try it. Please enter me!! OOOHHH!! Games!! Sounds like a fun game. If I don't win I will have to go to their site & check it out! My little ones would love this one!!! Please enter me too:-)! I have your button and I follow and adore your BLOGS! My little grandson would LOVE this...please enter my name! Thanks so very much and have a wonderful weekend! +1 I added your stay calm button to my blog in the buttons section. I had to save it, because the picture wasn't showing up, then put it on my blog. +1 Forgot my email the last time. This game looks really fun. I have your button on my page. This would be a great Christmas present! I blogged about it. This is just right down our ally. It looks so fun thanks for this chance to win it!!! I think this looks like a lot of fun!!! Since my 2 are older, I like that it is for 8 and up. Thanks for the contest!! I'm a follower of your awesome blog! Button, button, I've got your button! how fun...the family would love this! This looks like lots of fun! Count me in!